The first wireless MIDI pedal board controller for iPhone, iPad and Mac with the same degree of control and performance you've come to expect. Guitar and bass players, singers and keyboard players will now be able to play and control their preferred iOS app on stage or in studio, with the same degree of performance control offered by traditional music hardware, and the freedom of not being tethered by cables. The iRig BlueBoard from IK Multimedia is the first wireless MIDI pedal board for iOS and Mac that allows you to control your music apps and more from the floor and is small enough to fit in a laptop bag. Switch between presets, change patches, turn effects on and off, and control effects like volume wah pedals all from the stage floor without worrying about tripping over wires. Setup is as simple as turning the iRig BlueBoard on and telling it what you want to control. It connects to your iPhone/iPod touch/iPad or Mac via Bluetooth with control up to 10 meters away, and when you press its foot switches, it sends out control signals that are converted to MIDI by the iRig BlueBoard app. The control messages sent from iRig BlueBoard to AmpliTube or other Core MIDI music apps can include bank up/down, MIDI continuous controllers, as well as parameter changes on apps such as IK's AmpliTube, VocaLive, SampleTank, and iGrand Piano iOS apps plus many others, such as Apple GarageBand. iRig BlueBoard features four backlit soft-touch pads housed in a sturdy, stage-worthy chassis, two TRS expansion jacks for connecting additional MIDI controllers like expression pedals, and is powered by four standard AAA batteries. Each pad has an additional LED that lights when the pad is active, letting you know exactly which control is on. And since it's backlit, you can easily see it on a dark stage or performance venue for quick and accurate access. Ditch the messy wires and clunky pedals. Order today! iRig BlueBoard is compatible with iPhone 5s, iPhone 5c, iPhone 5, iPhone 4s, iPod touch 5th generation, iPad 4th generation, iPad 3rd generation and iPad mini. iOS 6.1 or later is required. 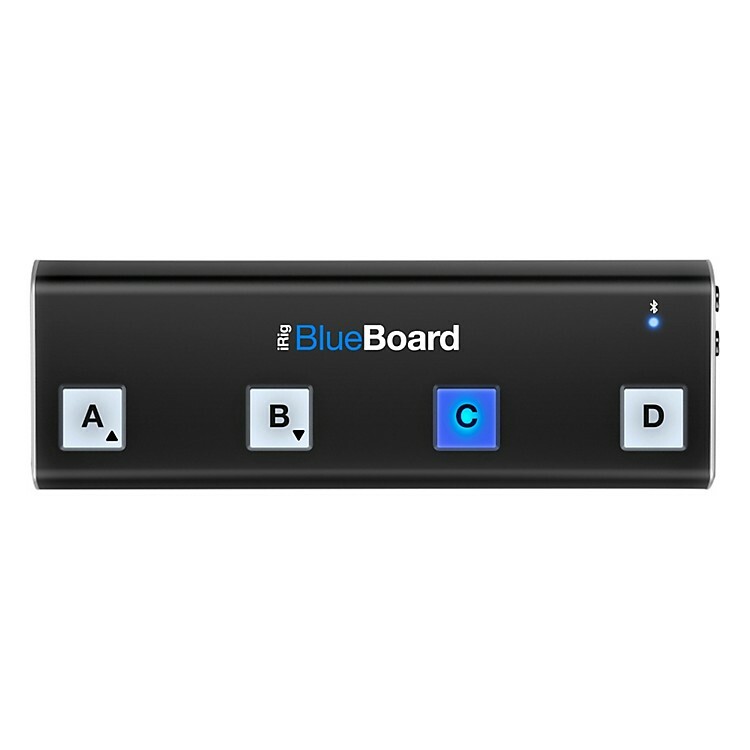 Mac: iRig BlueBoard is compatible with any Mac that supports Bluetooth 4.0 / Bluetooth Low Energy. Models: iMac, Mac Mini, MacBook Air, MacBook Pro (all models from June 2012 on).